Read All About It! - All the latest Greyhound Walks news. 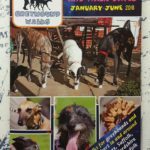 Stay up to date with all the Greyhound Walks news, read our walk news and see our photos. Also, we want your feedback! … What did you see? Who did you meet? What did you think of our choice of venue? … Tell us all about it on Facebook. We have a home on Facebook, please come and join us. Notley walk 8 July CANCELLED – still so hot!